Rob Gronkowski retires after 9 seasons and three Super Bowl rings. What’s next for the Patriots? Gronk went out on top, calling it a career after his third NFL title. ShareRob Gronkowski retires after 9 seasons and three Super Bowl rings. What’s next for the Patriots? Rob Gronkowski is going out on top. 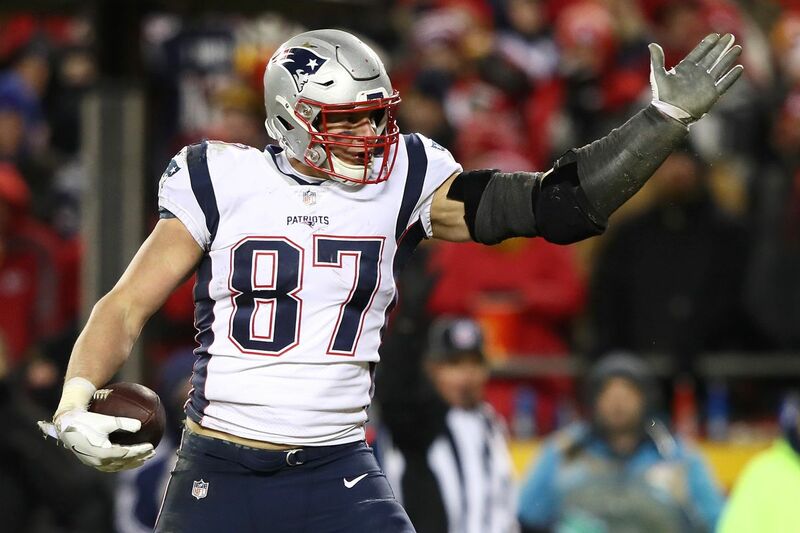 The game-changing tight end announced his retirement from the NFL on Sunday, less than two months after his New England Patriots won Super Bowl 53. Gronkowski announced his retirement on Instagram. Gronkowski steps away from the game at 29 years old but with plenty of miles on his odometer. The oft-injured All-Pro struggled through a long list of maladies through his NFL career, dealing with injuries to his back, forearm, groin, and knees that often kept him from the field — he missed 29 regular season games in his nine seasons in New England. While he claimed he was the healthiest he’d been all season before the Super Bowl, he decided against throwing his body into the fire for one more season, leaving a massive hole in the Patriots’ passing attack in the process. He finished his career with five Pro Bowl invitations, four first-team All-Pro appearances, three Super Bowl titles, and the title of 2013’s NFL Comeback Player of the Year. The Patriots, including head coach Bill Belichick and team owner Robert Kraft, were deferential when addressing his departure. What does this mean for Gronkowski? So it’s understandable he’d be interested in retiring before age 30. The good news for Gronkowski is he was able to put together a strong Hall of Fame resume in a relatively brief career. He’ll retire with three Super Bowl championship rings, multiple first-team All-Pro honors, and a litany of stories from depressed linebackers and defensive backs about how impossible he was to cover. At 6’6 and 265 pounds, “Gronk” was a nightmare to track up the seam as well as a crushing blocker who freed up space for his tailbacks. His 16-game regular season averages come out to 72 catches, 1,095 yards, and 11 touchdowns. He was just as good in the postseason, with 75 catches, 1,046 yards, and 12 touchdowns in his first 15 playoff games. Gronk was a monster, and the only thing that could effectively slow him was injury. He retires having averaged 0.69 touchdowns per game. Nice. What does this mean for the Patriots? Gronkowski is irreplaceable, and his retirement will put Bill Belichick’s “next man up” philosophy to the test. The Patriots have gone stretches without their All-Pro tight end in the past (see above), but moving on to life without Gronk means Tom Brady will be without the security blanket target he’d turn to in clutch situations across the past decade. Gronkowski averaged nearly seven targets per game in his NFL career — more than any other player on the roster. Brady had nothing but praise for the player who’d bailed out his offense in so many big moments in the past. The solution to the team’s newest problem likely isn’t already on the roster. Dwayne Allen had only 13 catches in his two seasons as a Patriot before becoming a salary cap casualty this winter. Behind Allen on the team’s roster were Jacob Hollister and Ryan Izzo, who each ended 2018 on injured reserve. Hollister has been one of Belichick’s pet projects as an undrafted free agent out of Wyoming, but he only has eight career NFL receptions. Izzo, a 2018 seventh-round pick, has yet to play a game as a pro. Gronkowski’s departure will also put a strain on an already overworked group of wide receivers. Julian Edelman regained his spot as the team’s top wideout this fall, but at age 32 will face questions about how much longer he can keep this up. Behind him are Phillip Dorsett, 2019 signees Bruce Ellington and Maurice Harris, and 2018 late-round pick Braxton Berrios. New England will have to make some tough decisions on who will be retained and who will be let go in order to revamp the team’s receiving corps. Although there’s a chance Gronkowski’s retirement isn’t quite permanent. The good news for the Patriots is there’s a solid pool of tight ends in the 2019 NFL Draft. Iowa standouts Noah Fant and T.J. Hockenson are both expected to be first round picks, though both may be gone before the team picks at No. 32. New England’s combination of need, position, and the fact Belichick has a strong relationship with Hawkeyes coach Kirk Ferentz could be enough to necessitate a rare trade-up for the Pats; either target could help mitigate the loss of Gronkowski while serving as a vital step in a Patriot roster overhaul. But neither will bring the blend of strength, speed, and concentration Gronkowski brought to the position. The oft-injured tight end’s star burned bright, and he’ll retire with a Hall of Fame resume and more than $53 million in career earnings from the Patriots alone. Now he’s free to expand his party bus business, show up at Wrestlemania, and just generally be the human personification of a golden retriever wherever and whenever he likes.